Late August 2013, I’m standing in The Void, a smallish club in San Diego. San Francisco’s Deafheaven takes the stage and begins their set with Dream House, the first track from their Sunbather album. I’m instantly pulled in as the My Bloody Valentine-esque guitars begin to wash over the crowd. By the time Clark’s vocals enter the space, we are already journeying to the beyond, carried further and further by pounding drums and heavy bass. I couldn’t understand what Clark was singing about, but it sounded like anger and pain. It seemed to me, that Clark’s vocals were expressing an intense suffering, which was surrounded by music pointing to something bigger, something ethereal and even compassionate. I had just found out about my mom’s cancer diagnosis days before, and this music offered me the transcendence I needed. 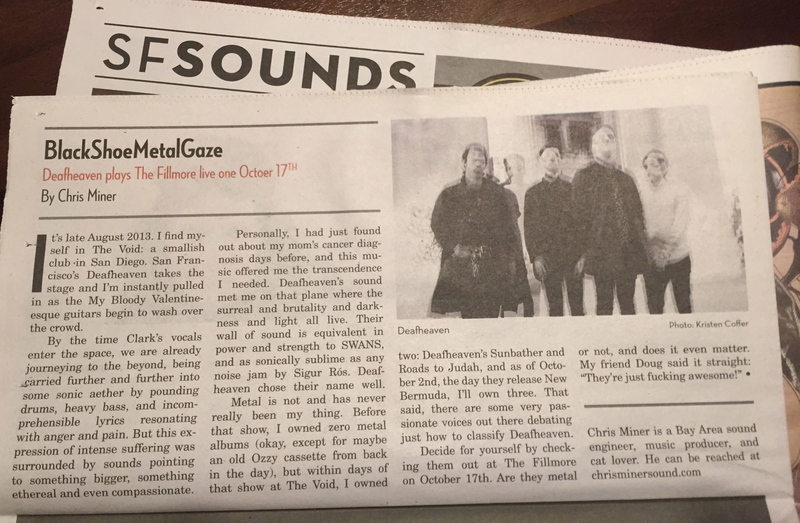 Deafheaven’s sound met me on that plane where the surreal and brutality and darkness and light all live. Their wall of sound is equivalent in power and strength to SWANS (which for me, is the band by which all walls of sound shall be judged), and as sonically sublime as any noise jam by Sigur Ros. 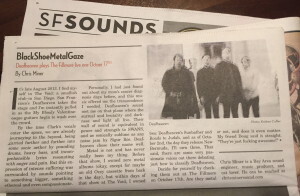 Deafheaven picked their name well.